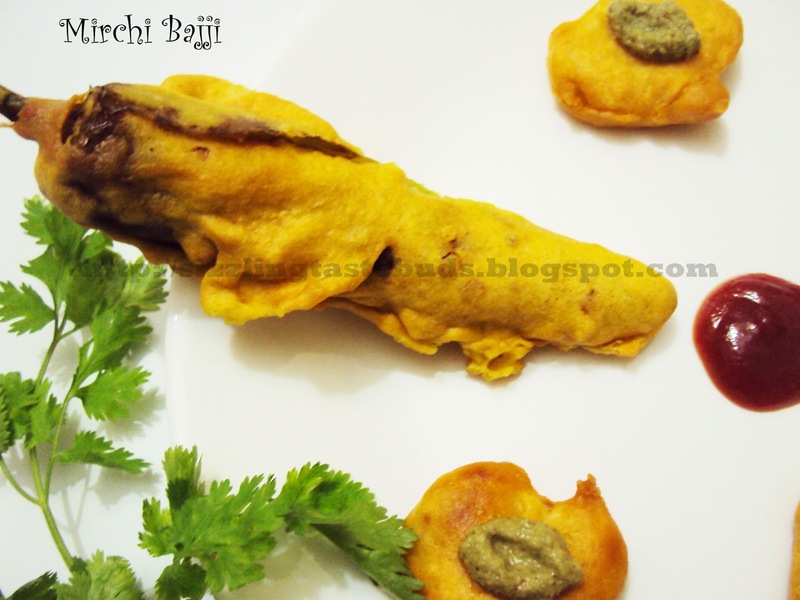 Mirchi Bajji is one of the most popular Indian street food. Those Street food items are always tempting. Bangalore's chill weather reminded me of this and it was a perfect dish with a cup of hot tea on a Sunday evening. I always have to prepare Aloo Bajji's( Potato Fritters) for my son whenever I decide to make this. Vegetable oil - for deep frying. 1. Slit the mirchi's and remove the seeds in case you don't like those or find it too spicy. 2. Prepare the besan batter by adding sufficient water to get a thick free flowing consistency with all the ingredients mentioned above except oil and Mirchi's. 3. 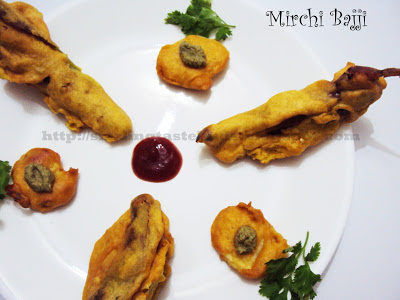 Dip each mirchi's in the batter and drop it in a hot oil for deep frying. Fry these in low-medium heat. Fry these on both sides till done. 4. Remove the fried bajji's from oil and place it on a kitchen tissue to absorb excess oil. 5. Serve it with Tomato ketcup or spicy Pudina/ Coconut Chutney along with hot Tea/ Coffee.